I'm terrible at remembering to charge my phone. I'm prone to leaving Candy Crush running while it slowly dies overnight, rather than taking the time to get up, plug it in, and make sure it's charging while I sleep. 1. It's sleek. No random colors or strange shapes here. 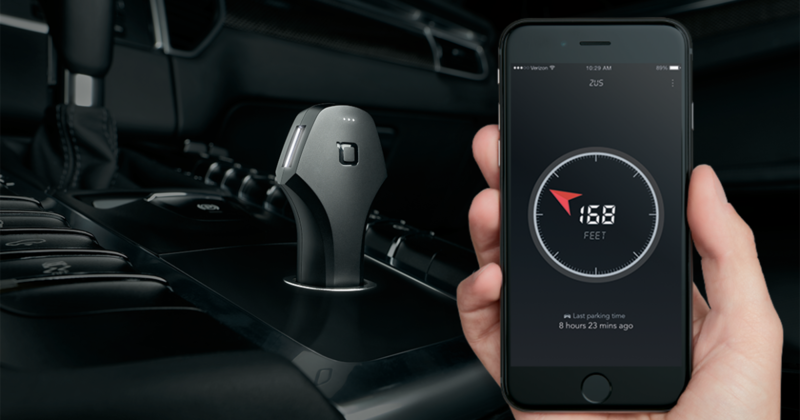 Just a black, streamlined-looking gadget that pops into the car charger and doesn't get in the way. 2. It has lights! Find it in the dark when plugged in! 3. Charge your choice of device. With its smart charging system, you can charge your iPhone or Android device with the same charge quality. No more of that "Apple only device" port nonsense. 4. Know when you parked. Put money in the meter? Use the app to remind you when you parked and avoid paying a hefty fee! Charge your devices two times faster than normal car chargers and charge two devices at once with the ZUS Smart Car Charger. This makes family trips so much more tolerable, because you can charge the Kindle, iPad, iPhone, Android, or whatever USB device you want while in transit. (Charge two of the same type of device, if you want!) Time just flies by! There are some other neat tech specs you might be interested in (like military grade heat resistance), but the bottom line is this. Moms needs a charger that works on the go -- every. single. time. This is that charger! Snag it for under $40 at the ZUS website. It's great for the busy soccer mom season or when you just need a reliable charger for the road. *Sample received to try out. Opinions are my own.